Our alarm clock went at 05h00, it is time to go back to the airfield. Last minute last night we booked a heli transfer to take us from the hotel direct to the airfield, first thing this morning: we would achieve a couple of things, Dietmar was worried regarding the boat and him getting sick and than having a full day of flying and we would get to the plane 2 hours early. Well the heli transfer was cancelled because of strong wind, (R44). Onto the boat, up and down the waves, thank God, a different boat today, nice and slow, up and down, it took 2hours plus. 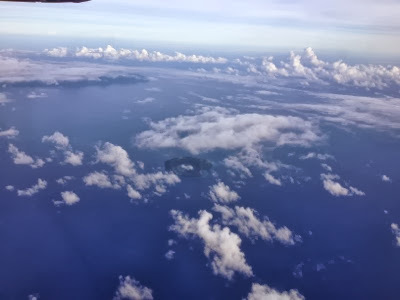 Romblon Island, 10h38, local time, we are ready to depart, same place we landed on Monday in the rain with changing visibilty, it is windy, warm, dry. We depart first, everyone is waving Good Bye. We will see each other again within a couple of hours in Iloilo, our last station in Philippines for Immigration/pass control. Then we fly on to Manado for the night, that flight will be about 4 hours long. Inside the aircraft the interior side of the roof is very wet, as I write this Dietmar complains water is pouring out again. We arrived, refuelled, immigration control was present, and then we waited, and waited and waited, nearly one and a half hour for customs....they never arrived. We were then told by our handling agent we could leave. What were we waiting for? Next we asked for departure clearance, we were asked to wait. And we are still waiting. It is now 12h50 local time, depending what time we can leave here, we might not make it before dark. It is now 13h20, we are still standing. Dietmar is beside himself. He keeps asking tower, they are appologetic but have not heard from onward ATC, Air Traffic Control. Nothing we can do. A further 10 min we get the go-ahead and we leave the place. At exactly 16h16 we cross the border to Indonesia, outside Temperature 0DegreeC at FL 160, we have a ground speed of 181kn. Below us a small island with a lake in the centre, must have been an vulcano. At every landing or departure Dietmar still gets a shower over his head! It is quite funny, not for him though. Sunset in Mandano will be @17h40. Our ETA will be 17h17. Then immigration, then rest. Toll! Eine Dusche hat doch auch nicht jeder im Flieger! How lucky can one be ?? ?